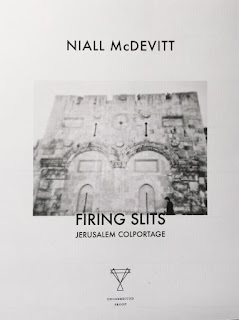 Firing Slits: Jerusalem Colportage is my third collection of poems. The previous two books were sited in London; this one exports the London psychogeographical method to the city of Jerusalem. Prose poems, lyrics, journals, epigrams... a description of an eternal war zone. Why Jerusalem? I'd had enough of using the word 'Jerusalem' as metaphor. Inner voices forbade me from using it again unless there was a direct connection between signifier and signified. William Blake agreed, and let it be known he had no objections to my booking an Easyjet. The poet with the lowest carbon footprint after Emily Dickinson was indulging me. 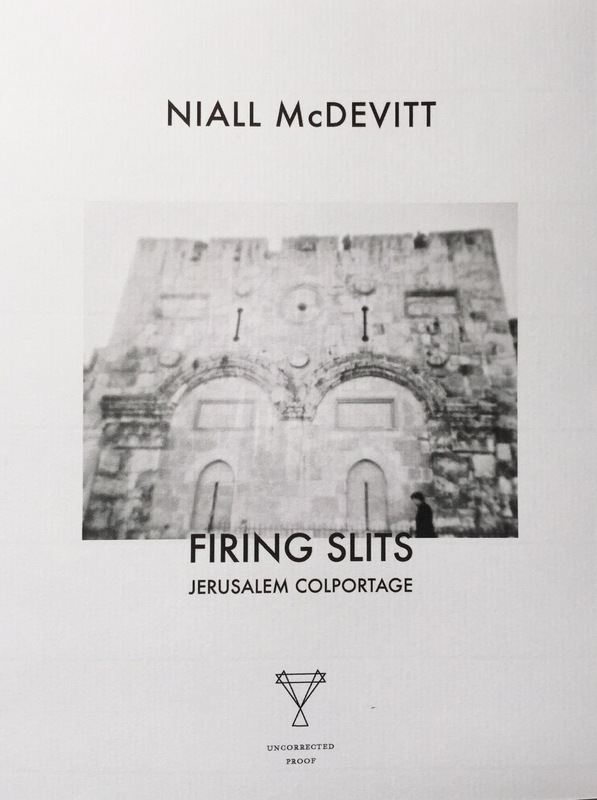 The book merges two titles: Firing Slits and Jerusalem Colportage. Either would have sufficed, together they're a mouthful, but Jerusalem Colportage seemed a necessary qualification, locating the slits, adding a mystique. Jerusalem Psychogeography was a rejected option. Too commercial, too obvious. As Blake's idea of 'Mental Traveller' is avant-psychogeography, I stumbled upon another genius's earlier cutting of the key. 'Colportage' is a word that appears in Walter Benjamin's On Hashish. It implies street distribution, hawking of religious tracts. Colporteurs were once commonplace in towns and villages of Europe. 'Colporter' is a modern French verb for gossip. Benjamin invents his own hashashin ideal - “the colportage phenomenon of space” - whereby it is possible to imagine all the events that ever occurred in a place happening simultaneously. The space becomes colporteur of itself. The city was welcoming. The November-December 2014 weather was like an excellent English summer, with occasional biblical downpours. Youthful visits to Belfast became helpful retrospectively. Both were capital cities, divided on sectarian lines, scarred by dirty war. But I quickly realized a lapsed Irish Catholic was safer in Jerusalem than Belfast, and freer to navigate the humanitarian gulf. A failed exploration was perhaps the most successful. A journey from the Arabic bus station on Suleyman the Magnificent Street to the Jerusalem suburb of Abu Dis was bitterly exalting. Abu Dis is chopped in two by the separation barrier, also known as the Jerusalem Envelope. It was my first crossing through IDF checkpoints, and I was scared. I wanted to see the unfinished Palestinian Parliament, simultaneously building site and ruin, but I didn't know which side of the divided town it was in, nor did locals understand my question. (My own Arabic was limited to 'sucran' and 'habibi'). What I did see of Abu Dis was heartbreaking, the wall, the graffiti, the deserted campus, an educated pauperized people. In the Old City, the Haram al-Sharif was the most moving religious site, a daily excursion, and the Dome of the Rock the most astonishing vision. The WAQF administration keeps it sacred, but the zone is a spiritual battleground, coveted by Israeli ultra-nationalists. A question haunts it. How can you have a Third Temple without having a Third World War? More comically, my efforts to find a former tourist attraction known as Jeremiah's Grotto - where the poet of Lamentations had been imprisoned for prophesying the sack of Jerusalem - led me to a cave filled with bananas. The grotto hadn't attracted enough custom. It was now a fruiterer's warehouse. The French poet - now Jerusalemite - Gabriel Levin, author of Hezekiah's Tunnel, showed me a storyteller's Jerusalem. He explained how the prettified Russian Compound was a top security prison for insurgent Palestinian youths, and told me of a Bob Dylan concert on the site of Gehenna, the Jewish hell, where the sound system failed. Poets from Joshua to Milton to Ginsberg had decried Moloch, so Moloch avenged himself by silencing the prophet Zimmerman. The Educational Bookshop on Saladin Street became a hangout. You could drink Arabic coffee in the company of a portrait of Mahmoud Darwish, whilst keeping an eye out for reputed regular Mordechai Vanunu, two modern culture-heroes of Palestine and Israel respectively. Meanwhile back in London, the manuscript was accepted by New River Press run by the supremely talented poets Robert Montgomery and Greta Bellamacina, and named after the New River that runs from Hertfordshire to Stoke Newington. My poems are lucky. Robert Montgomery is a world-renowned text artist, a verbal-visual pioneer, and his design for the book is beautiful. A descendant of Pentecostalists, he appreciated the glossolalia of the book's vocabulary, and he and Greta have become its colporteurs. I now find myself a member of an independent/leftfield/bohemian collective which also includes poets Rosalind Jana, Zimon Drake and Heathcote Williams. I will try, in poems, not to use the word Jerusalem again. I swear to try. Niall McDevitt is the author of two critically acclaimed collections of poetry, b/w (Waterloo Press, 2010) and Porterloo (International Times, 2013). He is an urban explorer who specialises in the revolutionary poets of London, particularly Shakespeare/Blake/Rimbaud/Yeats. He blogs at poetopography.